Public speaking is nerve-wracking for a number of reasons, but one thing you shouldn’t be overly concerned about is saying the wrong thing. Making a mistake—whether it be incorrectly citing a statistic, mispronouncing a word or something else—need not derail your presentation. Relax. Remember that your audience is not looking for perfection. People are just hoping to leave a bit more knowledgeable or inspired than when they arrived. Chances are great that no one is waiting to catch you in an error. And if you do happen to have someone like that in your audience, there’s no pleasing that person anyway. Focus your energy on the rest of your listeners. Those people recognize that everyone makes an occasional mistake and won’t discredit you for it. Know when to let it go. The majority of mistakes aren’t worth mentioning. If it’s something that your audience won’t notice or that doesn’t affect the message of your speech, it is not necessary to point out your error. Example: You share an anecdote about your sister but accidentally refer to her as your cousin. That mistake might require an explanation at a family gathering but not when speaking to an audience of strangers. They won’t know the difference. Take your time. Some mistakes do require an explanation, so don’t rush through those corrections.Example: Because you are very familiar with your topic and your presentation, your brain can easily leap to “I just realized those graphs from five minutes ago were about 2010, but I referred to them as 2012!” Your audience members, on the other hand, will be confused if that correction comes out of nowhere. Instead, finish the point you are making, pause and say “Excuse me. It just occurred to me that I misspoke earlier.” Bring up the slide with the graphs and explain the mistake. Then ask the audience if they have questions about the information. After that, move on and don’t worry about it. Be gracious. If an audience member points out a mistake from your presentation, don’t take it personally. Remember that your main objective is to impart information—not to impress people. A correction from an audience member helps ensure that you reach that objective, so appreciate the input. Example: Say “Thank you for catching that! I must have been so excited that I mixed up the names.” Then repeat the correction loudly and clearly so the rest of the audience hears it. Follow up. Collecting attendees’ contact information is useful for many reasons, including correcting a major error that you made during your presentation. Send audience members a brief email with the accurate information. Example: “Dear friends, I enjoyed speaking with you last night and appreciated your attention. I realized this morning, however, that the data I gave you on XYZ contained an error, and I felt you should have the correct numbers. Here they are …” Note: Do not use this method to follow up on minor mistakes. You do not need to email audience members to explain, for instance, that the quote you attributed to King George IV on slide 16 was actually from King George III. Whatever the occasion, a good speech brings out the best in both the speaker and the audience. Good speakers are made, not born. You canbecome a successful speaker. It is a skill that is open to all of us. 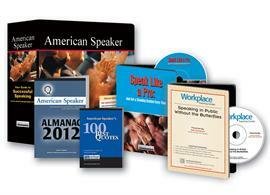 The Public Speaking Bundle gives you a step-by-step program for developing and giving speeches. It also provides—by far—the best training and preparation techniques that you can find. The 100 Best Quotes for 2012 book. The 2012 American Speaker Almanac. The DVD Speak Like a Pro … And Get a Standing Ovation Every Time. The audio conferenceSpeaking in Public Without the Butterflies. Get all of that for just $289! This entry was posted in American Speaker Forum and tagged anxiety, glossophobia, mistakes, Public speaking, training. Bookmark the permalink.